Players 1, 2 and 3 have a ball. Player 1 starts the drill by shooting the ball, rebounding and then making a pass to player 4 or 5. Player 2 and 3 also shoot the ball just after player 1. All players rebound their own shots and make a pass to the open players outside the key who are ready to catch and shoot. 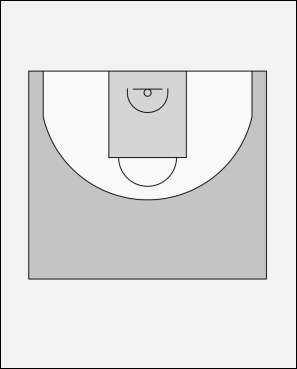 - shooters must call the name out of the rebounder so that organisation is maintained. Play to a time limit or target score either individually or as a group.